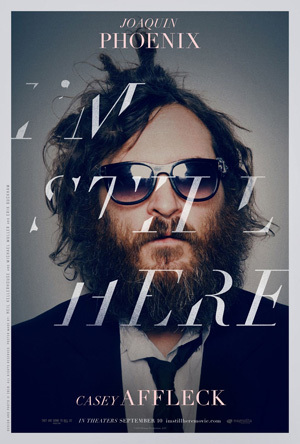 The mockumentary, I’m Still Here, is part of a hoax carried out by Joaquin Phoenix with the help of Casey Affleck. The idea was to convince people that Phoenix had quit acting in order to become a hip-hop artist. Since rumors immediately began to circulate that the whole thing was hoax, it can’t be said to have been very successful. Its main result is this film, ostensibly a documentary following Phoenix during the roughly yearlong period when he was supposedly pursuing a career in hip-hop. In it, Phoenix portrays himself as a sleazy and unpleasant character. We see him snorting cocaine, picking up prostitutes, and spewing verbal abuse at the people around him. There are moments that are clearly meant to be shocking: we see a man defecate on Phoenix’s face, and there’s an extended scene of Phoenix throwing up into a toilet. One of the jokes in the film is supposed to be that Phoenix is unaware that he’s terrible as a hip-hop artist. (The best thing in this film is the expression on Sean “Diddy” Combs’s face while he’s listening to some of Phoenix’s recordings.) There are a few funny moments, but overall I just found this movie annoying. The irony of all this is that Phoenix’s clumsy and heavy-handed parody of celebrity self-absorption and narcissism leaves one suspecting that perhaps he really is self-absorbed and narcissistic, just not in the way that’s shown in this film. This entry was posted on September 29, 2010 at 1:18 am and is filed under Cinema. You can follow any responses to this entry through the RSS 2.0 feed. You can leave a response, or trackback from your own site.